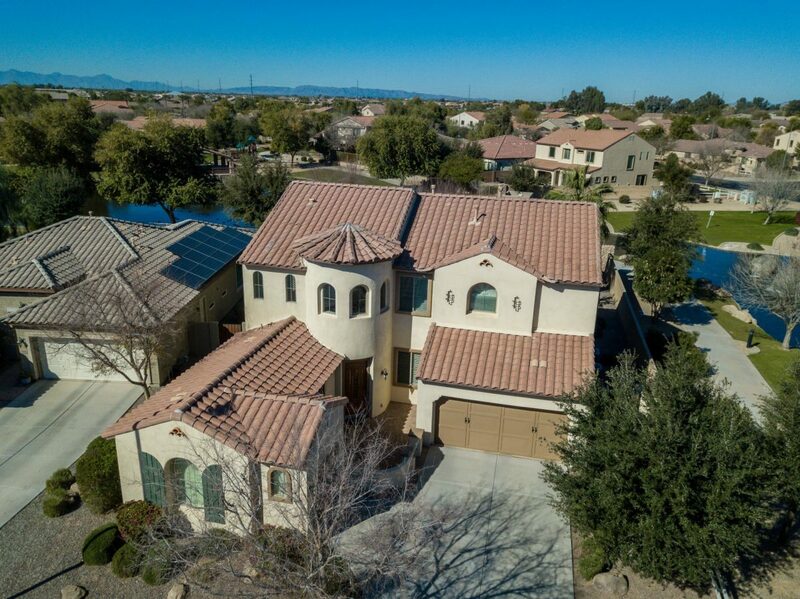 Welcome to 4158 S White Drive, Chandler! This former model home features many luxurious upgrades and is THE best waterfront location in Old Stone Ranch! You will be delighted with the custom paver courtyard to enjoy sunny mornings. The grand entry features a beautiful stone and tile medallion that leads to the formal dining and living rooms where the wrought iron and wood rail adds to the open style floor plan. The home features beautiful wood floors and high end patterned carpet. The full bath down is tiled throughout. The kitchen features newer, high-end stainless appliances with a gas range for those gourmet cooks plus granite counters, beautiful brushed nickel back-splash and a custom style breakfast room. Cozy up to the stone fireplace listing to your favorite tunes from the surround sound built in speakers in the ample family room. Other upgrades include decor paint, custom draperies, and real wood window sills throughout. The upper level features a large loft with an elevated den that can also be a great playroom. The dual entry door to the master suite gives an grand entrance and leads to the luxurious bath featuring a soaking tub and shower with tile accents. Garage features an epoxy floor, softwater system, too. The lush yard features lots of shade and overlooks the lake plus sides to the park and stone waterfall entry. Enjoy many a evening listening to the waterfall in peaceful serenity watching the sunsets and wildlife over the lake. Author Gina McKinleyPosted on February 1, 2018 May 10, 2018 Categories Community Info, GeneralTags #4158SWhiteDrChandler, #GinaMcKinleyGroup, #REMAX, #ReMaxMasters, Chandler AZ, Gilbert AZ, Gina McKinley, Mesa AZ, The McKinley Group, The McKinley Group #OpenHouseLeave a comment on Welcome to 4158 S White Drive, Chandler!